What a painting! An intense gaze arrests your attention and on the chess board an exciting move is just being made. You want to decipher it. Your eyes stay focused on the table, but are also drawn towards the distance. Many things, seemingly of great importance, are happening at once. Still there is tranquility in this messy corridor of a rural house on a quiet and sunny afternoon. It looks like ordinary every-day life, yet the image is interlarded with the mystery of Life – simple and profound at the same time, a message from eternity caught in human time. This is a mysterious work painted with meticulous precision. ‘Spiritial realism,’ is what the Catholic artist calls it. How Gyula Somos works and what he makes springs from his conviction that a higher reality is hiding behind the visible domain. Who looks at this painting, is taken up into the unusual composition. Only part of the table in the foreground has been painted, as if we ourselves are sitting at the table or standing next to it. We become part of the action and are challenged by the pensive gaze of the chess player. But what exactly is going on? Step by step we try to decipher the symbolism. 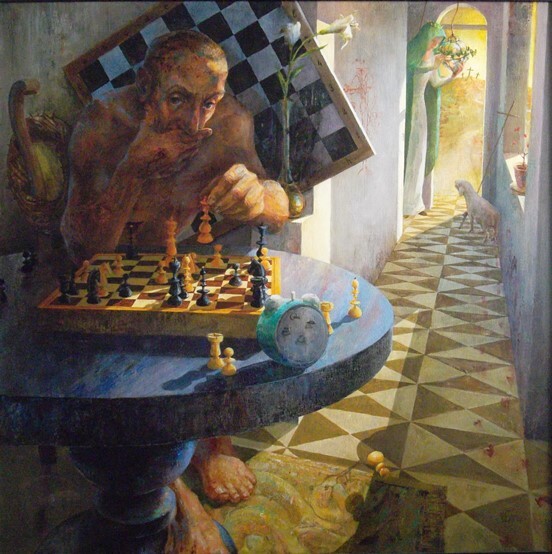 The chess player clearly is a Christ figure with his stigmata, the crown of thorns hanging on his chair, his feet on the motif of a snake in the carpet. The chess board on the wall behind him mirrors a vague dark face – of the opponent, somewhere behind us, of Satan himself? This reflection is broken by a vase with a lily. Traditionally the white lily is a symbol of light, peace, resurrection and royal dignity. In Judaism it was often used as a designation of the tribe of Judah, while in Christianity it points to the virgin birth, to Mary, innocence and purity. On the corridor wall we see the old Roman graffiti of a crucified donkey, made as a mockery of the Christians. On the right hand side the corridor is stained with the blood of the lamb. The lamb has halted close to Mary. Both have been painted with symbolical attributes: an eternal flame and a cross. The lamb is on his way out, to the hill, to Golgotha. The perspective directs our gaze from the intense scene inside to the outside, into the distance. But what is happening on the chess board? On it we see the last move but one of the historic ‘immortal game’ between Anderssen and Kieseritzky in 1851, one of the most beautiful games ever played. Black has hardly lost any pawns and seems to win. White is suffering great loss. And then comes the last move but one. It is white’s move. White dares to sacrifice its queen for victory’s sake. With minimal means, with two horses and a bishop, black is checkmated. Through the combination of the old iconography with personal associations a new, layered message has come into being. The solution is already present, the work is saying, here and far away, at the beginning and at the end of all time. Seen from the perspective of eternity everything can be captured in one image, even though everything has its own time. The ultimate victory is won, yet it needs to be won over and over again within us until the fullness of times. We are involved. What a painting! Gyula Somos: The Last move but One, 2005, oil on canvas, 1,2 x 1,2 m.
Gyula Somos (1960) studied at the Hungarian Art Academy with Pál Gerzson. Upon finishing his studies, he moves to Amsterdam in the Netherlands. Since 1991 he teaches at the Ruudt Wackers Academy in Amsterdam. Around that time he started to combine his early expressive style with a very precise realism. For more, see www.somosartgallery.com. Anikó Ouweneel-Tóth is cultural historian and art advisor. She specialises in contemporary Christian art. She was one of the initiators of the Platform Kerk en Kunst (Platform Church and Art) in the Netherlands. Together with Marleen Hengelaar-Rookmaaker she edited the Handboek voor kunst in de kerk (Buijten & Schipperheijn, 2015).